Attention men: Beer (consumed in moderation) can have health benefits. 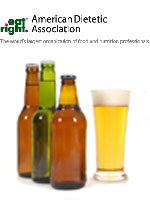 An article on links between beer and heart health is just part of a revamped section on men's health that can be found on the American Dietetic Association's website at www.eatright.org/menshealth. Health, strength and energy are hot topics, especially for males of virtually any age. For that reason, men need reliable resources that communicate accurate nutrition messages. "Sometimes men do not like to ask questions, but they want answers – and ADA's website site has added new and exciting content for men," says registered dietitian Ethan Bergman, president-elect of the American Dietetic Association. ADA's online men's health section has the science-based information that men can trust to help them lead healthier lives. "You can use the positive information on ADA's website to transform your life," Bergman says. Registered dietitians say men's questions, interests and needs regarding food and nutrition tend to focus on such areas as being healthier; looking good; performing at their best; having more energy; recovering from injuries and learning how they can excel through healthy eating and activity habits. Men's health runs the gamut from muscle-building while eating a vegetarian or primarily plant-based diet, to fueling before and after workouts to eating well throughout the decades of life. "A healthy heart is something every man thinks about – or should," Bergman says. "So, what guy won't want to read about links between moderate consumption of beer and heart health?" Grilling and eating lean for a "six-pack"
Eating right when money's tight. "ADA's new web content offers cutting-edge nutrition solutions for all men," Bergman says. "By educating men – and our family members and loved ones – we can encourage positive eating and lifestyle changes for men at every age." The American Dietetic Association is the world's largest organization of food and nutrition professionals. ADA is committed to improving the nation's health and advancing the profession of dietetics through research, education and advocacy. Visit the American Dietetic Association at www.eatright.org.